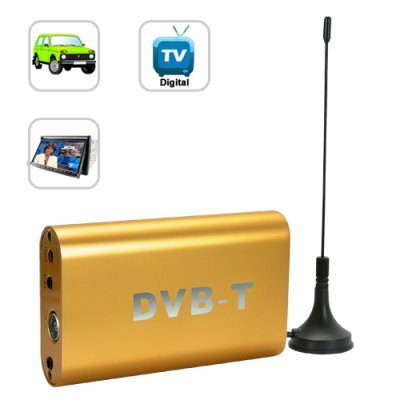 Successfully Added DVB-T Digital TV Receiver for Cars (MPEG-2) to your Shopping Cart. The easiest way to receive digital TV in your car. This DVB-T digital TV box easily hooks up to your existing car DVD player so you can start receiving DVB-T digital TV signals in-car for maximum automobile entertainment! Movies, shows, news and more - it's all yours! DVB-T: This is the perfect MPEG-2 encoded DVB-T device if you're looking to extend your in-car multimedia options or increase customer sales. Lots of Features: This digital TV box is the perfect complement to older or basic car DVD players without digital TV functionality. The minute you turn it on, it will scan the air for digital TV channels and give you the option to channel surf. News, weather, movies, sports, and TV shows are just an "Add to Cart" away! There's more...insert a USB flash drive into this digital TV box and it will play MP3 and AVI files from your drive too! This amazing product comes with our famous 12-month satisfaction warranty and is available with a factory-direct China Wholesale Price that you cannot find anywhere else. Orders yours today and we'll express ship it tomorrow. Brought to you by the leaders in online wholesale direct from China electronics - Chinavasion. What is the way to power this DVB-T? Where to plug the power cable? The Power Adapter has red and black terminals for connection to your car's battery. i have bought this product i recomend it to all,in romania we don`t have a lot of digital tv`s but it it very good for the us for watching movies. a good product with good value for money! Fast Shipping: Purchased February 4, received on 8 February! Hi Joel. According to Wikipedia, "France uses MPEG-2 for SD and MPEG-4 for HD transmissions". Meaning you should be able to pick up standard definition but not high definition TV with this receiver. I hope this helps. Do you think this unit can receive digital TV in France ?